I made my way to the gate for my next flight to find that we would be bussing to a remote stand. Given the size of the plane, everyone on the plane shared the same bus, so no separate bus for premium passengers like you get in Doha on Qatar. Since this was regional business class, the seats are the same, but there weren’t even blocked middle seats since the plane seating configuration was 2-2. As far as I could tell, this meant that every business class passenger got two seats to themselves, but the Russian couple in front of me sat next to each other in the first row, so I’m not sure if those were the seats they were assigned or they decided to move to sit next to each other. Considering that the flight is blocked for 55 minutes but the actual flight time is only 35 minutes, I had no problem with the seats, and I enjoyed the views we got taking off from Vienna and landing in Prague. Soon after takeoff, a flight attendant started the service for the flight. I’m always surprised by the amount of service that essentially all non-US carriers do in such short periods of time (see Qatar from Doha to Dubai as another example) when carriers like US Airways don’t even serve meals on flights under 3.5 hours. But I was even more surprised when the flight attendant asked if I had ordered a vegetarian meal, as there was a VGML sandwich for me. Also crazy considering that most US carriers won’t even do special meals for some international routes! 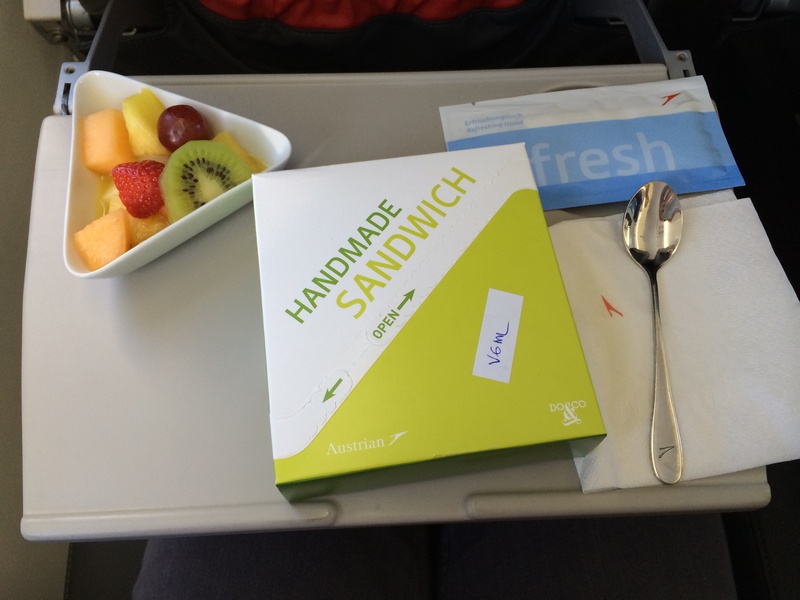 My sandwich was simple but tasty, and it was definitely more palatable than my terrible VGML meals on my flight from ORD to VIE on Austrian. And the flight attendants on this very short flight were also much friendlier than the flight attendants on my long-haul flight. This entry was posted in Austrian, Travel, Trip Reports and tagged austrian, travel, trip report on January 9, 2014 by Edward.